Grab your life jacket and strap yourself in for some high-speed fun in Cairns on this 35 minute jet boat adventure that combines thrills and sightseeing in the one enjoyable experience! 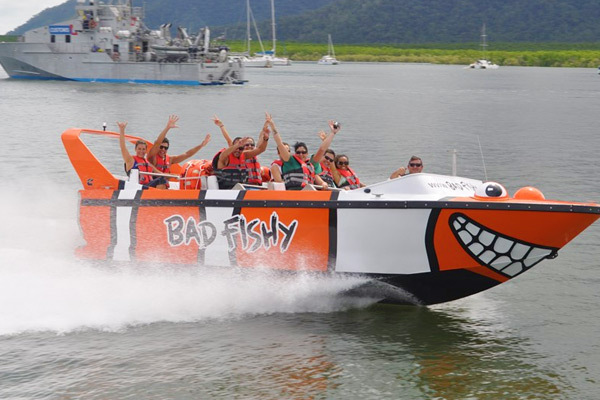 On this Cairns jet boating ride, you'll join the friendly and fun-spirited crew aboard "Bad Fishy", a turbo-charged jet boat, and head out on the water to perform a range of tricks and turns such as spins, slides, power-brakes and even the occasional 360. As the music cranks up, you'll speed through the scenic waterway of Cairns' Trinity Inlet with its wonderful surrounding mountains and wildlife-rich waters adding to the great atmosphere. Keep your eyes open - if you can! - for local marine and bird life; if you're lucky, you might even spot one of the famous Cairns locals - a crocodile! Along the way, your jet boat captain will also provide you with some detailed, informative commentary on the local area and regional highlights, providing some background for all the great things you'll see throughout the ride. Departing from the heart of Cairns, this jet boat experience is a great value and enjoyable outing for the whole family; as long as you're willing to embrace some high-speed fun (and don't mind getting wet), you'll be in for one of Cairns' best tours that's fun for adults and kids alike! Trinity Inlet is surrounded by stunning mountains and the beautiful waterway is home to mangroves, wildlife and if you are lucky you may even spot a croc!